The new studio CD features 15 songs/14 never before on CD! 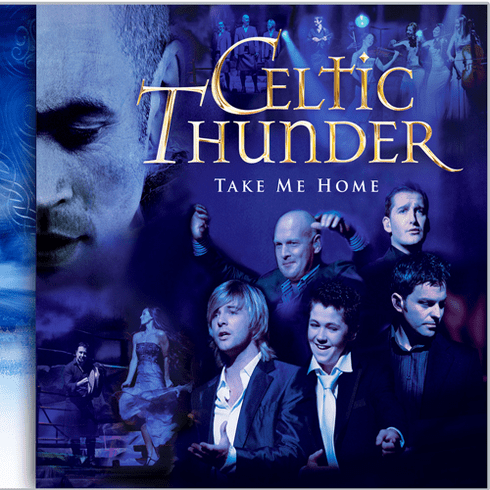 Celtic Thunders new CD "- Take Me Home" is new songs not featured on previous CD's. It will have 5 songs that are not on either the Pledge TV show or the new DVD. These are "Homes of Donegal" and "Wichita Lineman" from Keith, "Because We Believe" by Paul, a new original "Midnight Run" with Ryan and all of them in "Green Fields of France." Also available: A new DVD with a running time of almost 2 hours features 13 new Celtic Thunder performances! Keith Harkin Keith is a talented Songwriter and excellent Guitar player as well as an amazing singer. Paul Byrom Two years ago Paul got to record the album of his dreams with a 54 piece orchestra. It was called Velvet and covered songs from the American Matinee era. Much to his delight it reached No.2 in the classical charts. George Donaldson George has played alongside many folk musicians and singers, including Jim McCann and others from the Dubliners and has performed at the famous Glasgow Barrowlands. Order NOW to be sure you get your copy of this very popular item.